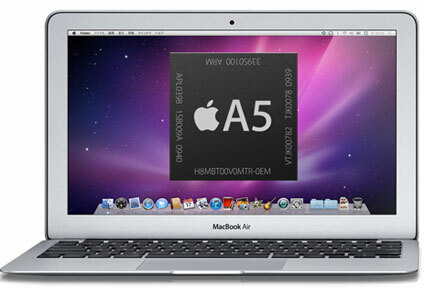 The hidden sources of Macotakara, claims Apple is currently testing the next generation MacBook Air Netbook with A5 processor chip, the shocking thing is, it is the same chip which Apple uses in the next generation iPad 2. According to their complete report, their source has managed to see the prototype of the device which is currently under testing in labs, reportedly the machine manufactured by Quanta Computer. And additionally, an anonymous source told more information, Apple already made test equipment of Thunderbolt MacBook Air driven by A5 processor. According to this source who saw live A5 MacBook Air actually, this test machine performed better than expected. Macotakara has a good reputation in rumors community; recently they kick out the some accurate information about the next gen iPad 2. Well Macotakara also says, it is unclear to say about the version and type of Operating System which running in the prototype of MacBook Air for testing. They said Apple is reaching the final stage to launch the Mac OS X Lion, so the folks over Apple Labs might be running it on the prototype.